« It’s alive!… Wait, is that sourdough bread I smell? Before my wife begins what I believe is an undeserved ego-inflating entry (Thank you dear. Made my day. So did eating the remaining frittata. ), I want to thank two other sites. This is our entry into Weekend Breakfast Blogging #4. This month it’s being hosted by Pavani over at the Cook’s Hideout and the event was started by Nandita over at Saffron Trail. I love breakfast. I frequently make fancy weekend breakfasts and remind my wife I’m likely made up of 13% pancakes. As a result, writing up this post was pure pleasure. So, make sure you visit them and see what other people are eating. This looks delicious, no? It is! I feel compelled to rave about my husband’s frittata, since he is inappropriately modest in his portion of the post. This frittata was so tasty, so fresh, so spicy and so flavorful that I could have eaten half of it if I hadn’t needed to run out the door. (I can’t eat fast. It’s my stomach’s one failing. Why, stomach!?) Anyway, my husband talked me out of packing the leftovers for lunch, even as I was eyeing them hungrily. “Remember the pasta in the refrigerator?” he cooed. I was torn — this is my lot in life: Choosing between fresh homemade pasta or freakin’ delicious homemade frittata. I took the pasta, knowing it was slightly less likely to keep. Not that the pasta wasn’t good. But I was daydreaming about this frittata all day long. It has beautiful salsa verde, and is mounded with still more fresh salsa, those photogenic red onions, and sweet queso fresca. The eggs were cooked beautifully, delicate but not runny, and the chorizo had a delicious bite. The whole thing was magical. So I get home and tell my husband about my plans to devour the rest of the frittata the following day. Pause. “It’s gone.” WHAT? All of it? He nods, stoically. What!? He had eaten the rest of the frittata! This is tragic! This is terrible! This is an outrage! Why!!?? I’m getting worked up again just writing this. But the point is: It was that good. Really. Make it, try it — and if you can, eat the whole thing or insist on packing the leftovers in your lunch. 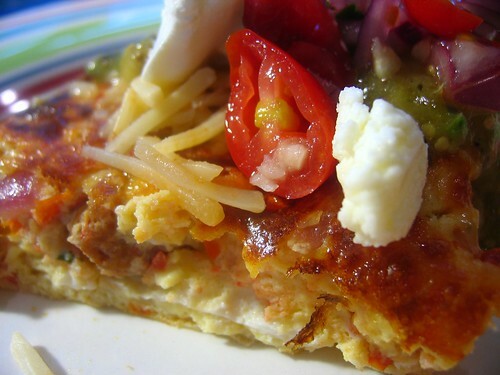 Frittata is honestly one of my instant pleasers for surprise guests or quick weekend meals. And I’ve made this on more than a few occasions when we’ve come home from a long trip and need something quick to eat but refuse to eat out one more time. First, if you’ve made salsa at anytime within the past few days, you’ve already done about 80% of your prep work. 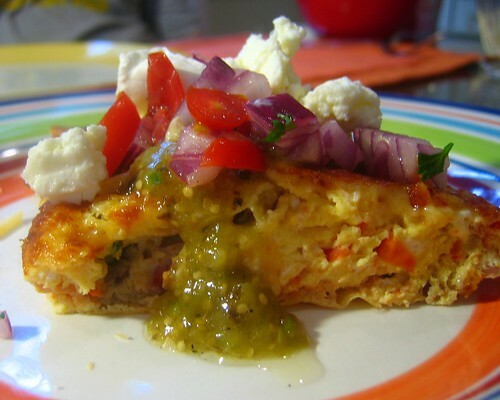 Salsa is, as in my taco dish and flank steak fajitas, the cornerstone ingredient in my frittatas. You use its freshness and intensity, married with the spicy chorizo sausage, to get a beautiful flavor that really makes the whole frittata. Already prepared fresh salsa at least halves your prep time. 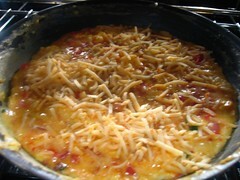 Second, frittata preparation is simple but the results are tasty and complex. Sure, scrambled eggs are nice and easy, too. Boring. And if you have the wrist flip down, so are fried eggs. If you’re in the mood for that. Omelets require patience, folding, and a bit too much attention when I’m trying to manage other things in the morning. 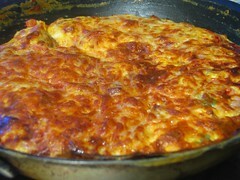 The frittata has this beautiful texture and softness caused by the cooking technique, which is relatively brainless. It begins with cooking the egg mixture like you would scrambled eggs, and then placing it under the broiler to finish it off. The result is, I feel, better than any omelets I’ve had to date — and without the omelet’s need for precision. Finally, two separate key ingredients remain for this particular recipe: chorizo and salsa verde. Chorizo is a Spanish pork sausage influenced by smoking and paprika. It’s very common in Latin and Southwestern cuisine and can be found easily. A few Cuban and Latin folks I know remind me that when they think of chorizo, they think of a dried sausage, much like pepperoni. But the type of chorizo I use most often is a fresh sausage. I can find it very often in the butcher’s case or next to the brand-name sausages near the hot dogs. It’s important to use fresh sausage here because we are really using the seasoned meat to make the meal go, and the dried version won’t contribute the same amount of texture and flavor. Now, we can discuss salsa verde or “green sauce.” This is made from tomatillos. These little green guys look like tomatoes but have a tangy, almost sour apple, quality to them. They are at the heart of most green sauces in Latin cuisine. Unlike tomatoes, they grow with a thin, paper-like husk over the skin. You can peel that husk away and see where they get their name; they look so much like red tomatoes we all know and love. What I make here as a salsa verde is very simple but has a good amount of kick, so use it sparingly — and if its too hot, don’t be afraid to add more tomatillos. This easy breakfast has lots of flavor. It doesn’t take too much effort to make. I hope you enjoy. Place a 10-inch, oven safe (no plastic handles) skillet over medium heat. Add the teaspoon of olive oil. Take the chorizo and remove it from its casing. It should become loose meat. In the skillet begin to brown the meat for about four min. Note: You aren’t going to need much in the way of oil. Once the sausage begins to brown it will give off fat that will help to cook it as well as other vegetables along the way. 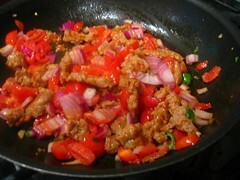 Once the chorizo begins to get a little color, add the cup of fresh salsa. This should sizzle away. At this point, you are letting the fat from the chorizo marry with the flavors in the salsa. This is where all your flavor is going to come from, so you really want to let the onions begin to change color. Stir it relatively often for about five minutes. In a large bowl, whisk together the 8 eggs with a teaspoon of salt and about 1/2 teaspoon of ground black pepper. It’s a lot of eggs, but you have to think in proportions. This can serve four people a nice-sized piece. So really it’s not that much food, just all coming together at once. 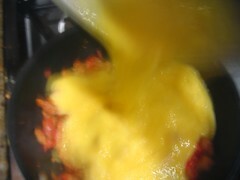 Once whisked together, add the eggs right in the skillet. With a rubber spatula or similar item, begin to mix and scrape the bottom of the skillet. Right now, you are treating this like scrambled eggs. You are simply trying to get the eggs to sort of build up a nice thick layer on the bottom. Continue to stir for about 3-4 minutes or until the eggs appear to be getting close to the setting up. Place the skillet about 6 inches under the broiler for 1 to 2 minutes. After it appears to begin hardening on the top, remove it from the broiler, add the cheddar, and return it under the broiler for 1 min. What you are looking for is a browned top. You should watch it carefully, because your oven’s intensity is unique and it can go from brown to charred fast. Once I put it back in the oven after putting the cheese on, I take a look every 30 seconds. Let cool for 5 min. Cut into slices and serve with whatever you want on top. Note: You can try to maneuver it onto a separate serving platform by running a spatula around and under the frittata, but I’ve always felt it step that is for show and sometimes ends up tearing up your beautiful work. 2. 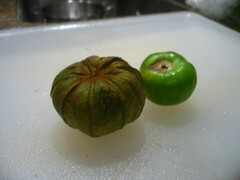 Peel the papery husks off the tomatillos then coat with olive oil and salt. 3. 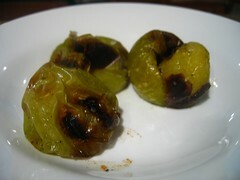 Over medium heat, grill the tomatillo for about 7 min. per side. You should have nice char marks on them and they should be beginning to lose their structural integrity. 4. 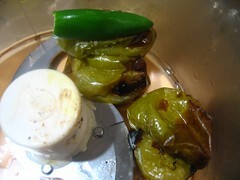 In a food processor, add the tomatillos and chile. The chile doesn’t need to be cut here. You can simply let the food processor do the work. Turn on the food processor and let it work until you begin to get a sauce-like consistency. While still running, add the tablespoon of olive oil. WARNING: Do not put your face over the feed hole for the food processor. You have a hot tomatillo that is now blending with a spicy pepper. The steam will give you an unpleasant pepper spray that you have to usually earn when you are on an episode of Cops fleeing with a dime bag of crack and someone’s TV set. Remember, those peppers are pretty, but they can be mean. Pour out into a service bowl. Salt and pepper to taste. I was inspired to review this recipe by your terrific posting of your spinach frittata (Dec 18 2006). I think this will be the second dish in my holiday brunch for those who like to wake up with a little more spice.